I have plenty of recipes 'on deck' but for some reason I just haven't been getting around to posting any of them. I have some pictures, so hopefully I will remember what I actually did with these recipes - because, of course, I can never just follow a recipe. I just really need to sit down one of these days and get them all written up, if only for my own sake. 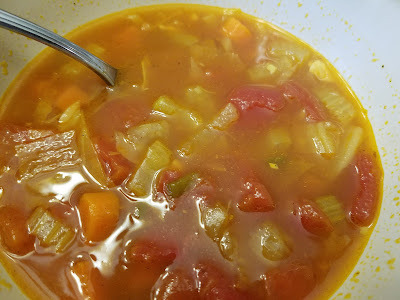 I've been fighting a cold this week, so the only thing that really sounded good was soup. I pulled some turkey broth out of the freezer, and I was just going to heat that up and drink it. But then I kept thinking of vegetables that would be good, so I just kept adding. Of course, feel free to add more or less or even omit a vegetable if you don't have it on hand. This is just what I did. This time. Heat olive oil in 2-quart saucepan. Chop onion, celery, carrot, bell pepper, and cabbage, adding them to the pan as you go. Cook, stirring frequently, until vegetables begin to soften; add garlic, salt, pepper, and turmeric, and cook for 1-2 minutes, until fragrant. Add broth and diced tomatoes. Bring to a boil; reduce heat, cover, and simmer for 15-20 minutes, until flavors are blended and vegetables are cooked. Season with additional salt and pepper if needed. Enjoy. 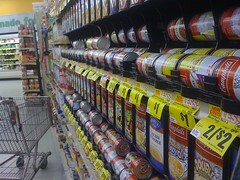 Oh, sure there are aisles full of canned soups in the grocery stores. So many choices, and all you have to do is open the can and heat it up - but this isn't much harder than that, and it's much better because I know everything that went into it. It was exactly what I needed, and now that it's gone, I'm probably going to make another batch of it tomorrow. Maybe I should add a jalapeno? That would certainly kick any last vestiges of this cold right outta there.